Durable, beautiful hardwood floors need not be a chore to clean. When cleaned properly, thoroughly and often, they'll provide you with decades of enjoyment and service. Since water can eventually dry wood and rob it of its natural luster, you don't want to apply much water or leave it on your hardwood floor very long, when cleaning. Adding a bit of alcohol to your vinegar and water damp-wash speeds the floor-drying process. Use the vinegar-alcohol-water solution for quick spot cleaning, too. Use a soft-bristled broom to sweep up any loose dirt and dust before applying any liquid to your hardwood floor. Follow broom-cleaning with a thorough vacuuming, using a soft-brush attachment. Add one-quarter cup of rubbing alcohol and one-half cup of vinegar to a gallon of warm water. Mix well. Work in small areas about 18 inches square. 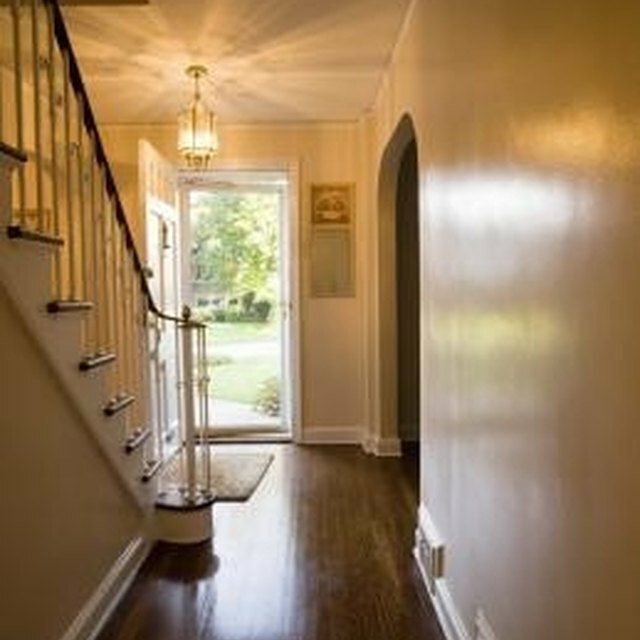 For hardwood floors in hallways, on stairs and in small rooms, dip a soft, lint-free cloth in the cleaning mixture and wring it out until it is barely damp. Work left to right, always wiping and rubbing in the direction of the wood grain. For ground-in dirt or sticky solids, apply a little alcohol directly to a soft plastic or nylon scratch-less pad and rub gently. Use a pencil eraser to gently remove shoe scuff marks. Sweep up any eraser residue before proceeding with washing. When you've completed washing the first area with your alcohol-vinegar-water mix, immediately apply a soft, dry lint-free cloth to absorb any excess liquid. Pay special attention to spaces between wood panels and along wall borders where moisture can easily be trapped. Continue cleaning the rest of the floor, section by section, being careful to clean and dry each area completely before moving on to the next section. Replace the cleaning mixture whenever it begins to appear dirty. Check for spots and streaks after you've finished the entire floor. Daub a corner of a clean, soft cloth in the cleaning solution and apply to any streaks or spots. Dry immediately. Use a soft-sponged mop dipped in the vinegar-alcohol-water solution for hardwood surfaces in large rooms. Wring the mop out until it is nearly dry, then mop in the direction of the grain. Sweep hardwood floors daily to prevent dirt build-up. Ask household members to wear slippers or socks instead of shoes on hardwood floors. Never let anything wet remain on a hardwood floor. Determine whether your hardwood floor is sealed or unsealed before applying any chemicals. How Can I Clean My Hardwood Floors With Dr. Bronner's?